Well, the name says it all. Labour Day is meant to be a day when everyone should not be working. However, this year, Labour Day falls unconventionally on a Saturday, which doesn't really benefit the office hours people aka us. With the recommendation from Rach, we wanted to check out the Riders Cafe. But to our dismay, the place is fully booked until Sunday 3pm (still have specific time wor!) Everyone is hungry on a Labour's Day. Unwavered, I went online and check out the possible places for brunch. I will not succumb to Mac-boring-Donalds! 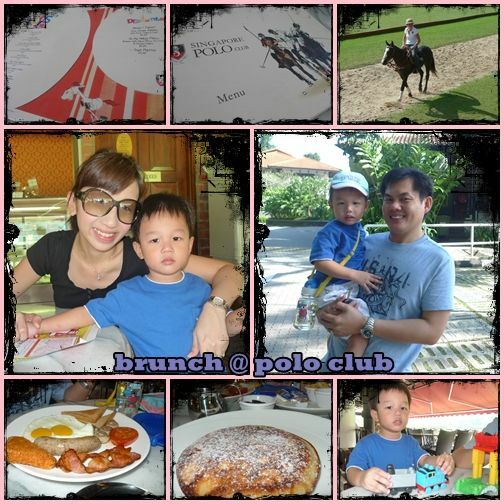 And so, we decided to go to Singapore Polo Club - a substitute from Riders Cafe and Jayden could still get to see the horses. To our delight, the place was practically empty and thus no reservations were required. Well, how can breakfast food go so wrong right? As expected, the boy enjoyed the horse watching. The food, on the contrary, was a total let-down. I ordered banana pancakes with berries and fruit compote. The name sounded so tantalizing but when served, it was only ONE pancake to share with the son, with no berries and dried compote that looked expired. Food bad, service horrible. It is little wonder why the place is empty. We were later informed that the restaurant will be closed to the public from July onwards. With that kind of unappetizing food and service, we were more than happy to scratch the place from our brunch list. We MUST check out Riders Cafe soon.